I posted the following comment on a story published by Religion News.On any given day, busloads of people from across the country arrive at the museum in Boone County. They come to see a biblical version of the origins of life, man and Earth. Religion News thank you for this story. I discovered the false teaching of those in the evolution camp a few years ago. It is disheartening to see the propagation of the faulty evolutionary hypothesis in North American museums and school and university classrooms. As an educator I have observed the longing for truth that many young people desire. Teaching evolution only brings despair, a loss of hope and a hardening of hearts towards God and his love for us. My visit to the Creation Museum in 2008 was a very positive spiritually uplifting experience. The exhibits, writings and staff are top notch. It is well worth the drive to the Creation Museum and a subscription to “Answers” the Answers in Genesis magazine. In fact, more than three years after it opened in this remote corner of Kentucky, the 70,000-square-foot “walk through the Bible,” consisting of animatronic displays, video features, theaters and restaurants has evolved into a thriving enterprise. “We have consistently surpassed our own forecasts for attendance,” said Mark Looy, a co-founder of the museum and spokesman for the center. 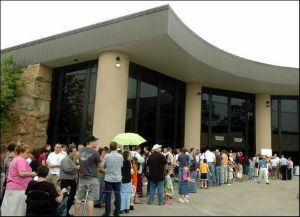 Last month (August), the Creation Museum counted more than 1.2 million guests since it opened in 2007, he added. While Ham and Looy expected attendance to be high for the first year because of the curiosity factor—there were about 500,000 guests in the museum’s first year—no one predicted the continuing growth in attendance. “Who’s on First?” is a vaudeville comedy routine made most famous by comedy team Bud Abbott (1895-1974) and Lou Costello (1906-1959). The skit became famous on live radio and was eventually presented for television on “The Abbott and Costello Show” an American television sitcom that premiered in syndication in December 1952 and ran until May 1954. The duo made 36 films between 1940 and 1956, and were among the most popular and highest-paid entertainers in the world during World War II. Comedian Jerry Seinfeld declared that The Abbott and Costello Show, with its overriding emphasis upon funny situations rather than life lessons, was the inspiration for his own long-running sitcom, Seinfeld. The comedy routine “Who’s on First” has Abbott identifying the players on a baseball team to Costello. However, their names and nicknames can be interpreted as non-responsive answers to Costello’s questions. The script will help you follow along. This video version is taken from “The Abbott and Costello Show“. David Spencer uses Digg. Digg is a place for people to discover and share content found on the web. From the biggest online destination to the most obscure blog, Digg surfaces the best stuff as voted on by our users. You won’t find editors at Digg — they provide a place where people collectively determine the value of content. In doing so, Digg is changing the way people consume and respond to information online.